The Yellow River is the second longest river in China and the third longest in Asia with a length of 5,464 kilometers. It originates in the Bayankala Mountains in Qinghai province in western China and flows through 9 provinces of China then empties into the Bohai Sea. Another name for this river is Huang He. It is called the Yellow River because huge amounts of loess sediment turned the water yellow. This is also a reason why it is categorized as the world’s muddiest major river. The Yellow River is slow and sluggish along most part of its course. Its average flow rate is 1,800 cubic meters per second. This river is commonly divided into three stages which are the upper reaches, middle reaches and lower reaches. The middle reaches is home to the Hukou Waterfall which is the largest waterfall on the river and the second largest in China. The drainage basin of the river covers an area of around 750,000 square kilometers and it delta covers an area of 8,000 square kilometers. This river also has various other names giver by Chinese people including “Mother River of China” and “the Cradle of the Chinese civilization”. Since 1960, more than 14 dams have been constructed on the river for hydroelectric power production. This river supplies water to approximately 12% of the country’s population and irrigates around 18 million acres. Declan, Tobin. " 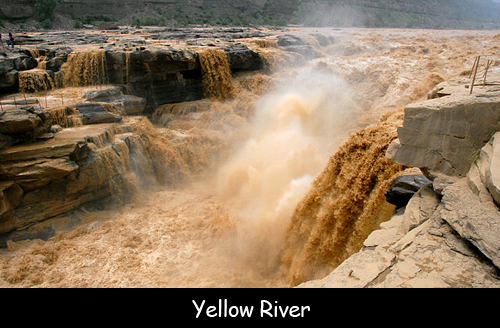 Facts for Kids about Yellow River ." Easy Science for Kids, Apr 2019. Web. 25 Apr 2019. < https://easyscienceforkids.com/yellow-river/ >.